Cleo Forstater has been a serial entrepreneur since she started her first business in 2009 at 16 years young. Learning through experience, she gained knowledge on authentic branding and marketing, event management and fashion and graphic design, among a multitude of other things. A graduate in Sociology from Warwick University, she is passionate about social issues, and is driven to use her life in service to humanity. Currently, she runs a creative agency called CleeCo that develops creative, innovative and strategic projects that are tailored to the clients, to facilitate real human connection between them and both new and existing audiences. Alongside this, she runs The Goddess League: a global sisterhood of women embodying self-love. Cleo has also written a book called Numah that is an expression of her process of choosing Love over Fear, and embodying vulnerability. Numah explores the experience of being human, and is a collection of Cleo’s self-reflections, that acts as an invitation for the reader to self-reflect through seeing themselves in Cleo’s words, and knowing they are not alone. Cleo Forstater is a healer, a person who embodies Divine Love in all activities, and is a powerful vessel for creation. 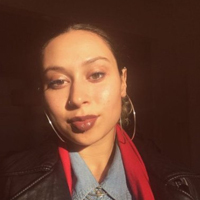 Cleo shares her truths, wisdom and knowledge through powerful public speaking, poetry, videos, podcasts, and writing. She expresses her creativity through art, fashion design, and songwriting. Cleo creates transformative, healing spaces through events, workshops, and 1:1 consultancy.